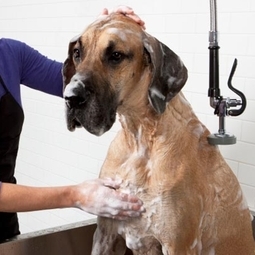 Our grooming facility provides our patients with a beauty spa day Monday through Friday. Our grooming service includes everything from simple baths to the most complicated haircuts for the show ring. All of our patients are constantly monitored by our staff. The benefit of having our groomer located within the hospital is that we can groom our "special" babies that do not comply to having their hair cut readily. We offer sedation for aggressive or scared grooming pets. They are then groomed under the supervision of our medical staff as needed. If you pet has any medical needs or wellness concerns while in for grooming we are happy to take care of them in the same visit so they can be seen by one of our doctors or cared for by one of our technicians.